Blade length : 70.9 cm or 27.91 inches. Width at the hamachi : 2.93 cm or 1.15 inches. 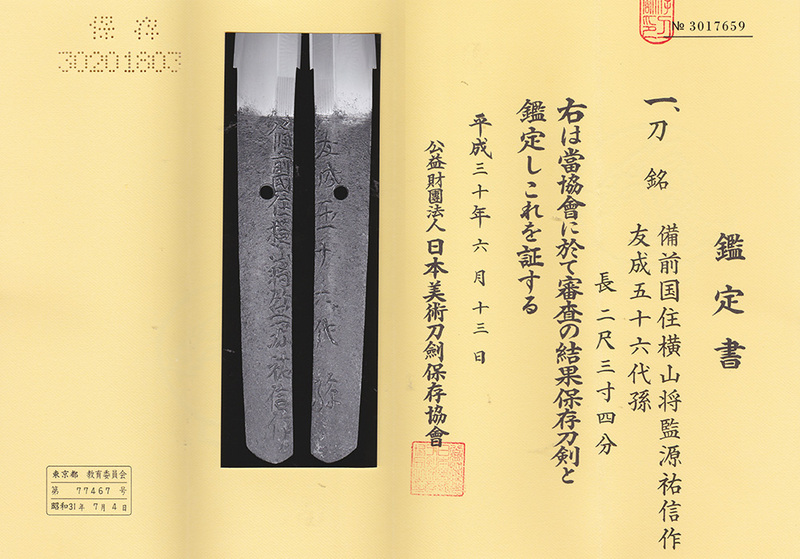 Width at the Kissaki : 1.815 cm or 0.71 inches. Kasane : 0.77 cm or 0.30 inches. Era : Edo period around Tenpo era. Shape : Regular width and thickness Katana with deep Sori. visible to see the texture. Hamon : From Hamachi is Suguha and then Kikka Choji Mireda. The Ha is bright. In the Ha, there are Ashi and Sunagashi. son of Kozukedaijo Sukesda. The Hamon is Gunome Midare with Choji. His student Yokoyama Shogaen Sukenobu succeeded the 2nd generation. He passed away on 26th January1857. From Aoi Art: Bizen Koku Ju Yokoyama Shogen Sukenobu was called Tomonari 56 Dai Mago. Yokoyama Sukenaga was also called Tomonari 56 Dai Mago. Yokoyama Sukekane was called Tomonari 58 Dai Mago. Yokoyama Sukeyoshi was also called Tomonari 58 Dai Mago. This Hamon is Kikka Choji Midare and Gunome Midare. The Ha is bright. There are many Sunagashi and Kinsuji. The blade is wondeful. You can enjoy this pieces very much. The navy Koshirae is also nice.